There’s nothing better than a bit of sunshine to boost your mood, energy, and creativity. It’s certainly a maxim fashion blogger and street style star Courtney Trop lives by. A self-professed warm-weather fiend, Trop was eager to get out of her native Pittsburgh as soon as possible. A couple of weeks after graduating from high school, she set her plan in motion — moving for a year to New York City before making the inevitable jump west to Los Angeles. Twelve years in, the woman behind the fashion and lifestyle blog Always Judging is firmly set up in her West Hollywood life. She’s a regular at all the city’s top spots and friends with the coolest up-and-coming designers (who conveniently let her use their studios to customize vintage finds she’s passionate about incorporating into her wardrobe). Still, her prior near-decade of working in the industry as a clothing and accessories buyer honed her eye for unique finds. These days, she translates that knowledge into mixing designer pieces, classic staples, and vintage finds she hunts down all over L.A. and on the occasional visit home to Pennsylvania. Case in point? Her unique twist on Polo Ralph Lauren's iconic polo shirt, seen here styled in three of-the-moment ways. A master of proportion and pattern, below Trop reflects on her personal fashion aesthetic, the coolest way to wear a polo, and how swearing off jeans can actually do wonders when it comes to upping your sartorial game. How would you define your style philosophy? "It changes every day, so I don’t like to pinpoint what my style is, but I do always like a little bit of hardness and roughness around the edges with anything that I do. I feel that I have a lot of masculine energy and even my mannerisms are masculine. So any time that I dress super girly, I don’t really feel comfortable. I always like to have something on that brings out my masculine side. I also don’t like to get dressed up. I prefer to keep things casual. If I get really dressed up, I’ll take it down with a cowboy boot or something like that." Do you have any pieces that you find yourself constantly reaching for at the moment? "My favorite thing in my closet is a pair of grungy platform creepers with studs all over them. They’re black and have that great, timeless combat-boot feel. I have probably worn them every other day for the past two years!" How has your style evolved over the past couple of years? "These days, I’m really all about wearing designer clothing rather than contemporary fast fashion. I like heritage brands but also enjoy wearing a lot of new, up-and-coming designers that I think are made well. I want to make sure my pieces stand the test of time and really last. I actually don’t care too much about accessories. I like shoes, but I’m definitely a clothing person. I’ll always buy a fabulous suit over a bag. Since I turned 30, I’m trying to only buy designer and vintage pieces that I’ll have forever. The goal is to have a smaller closet than I used to when I was younger." Were you into fashion growing up? "Yes, definitely! I always had my mom make me things — she actually made a lot of my clothes. I was also at the mall every single weekend." 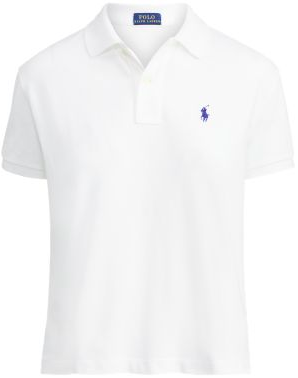 You’re a big fan of the polo shirt and all of the various ways it can be styled. Any memories of the iconic staple that jump out? 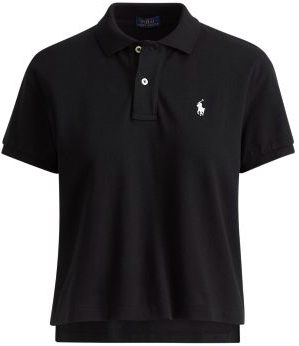 "I wore a lot of Polo Ralph Lauren when I was in high school — both the long-sleeved and short- sleeved polo shirts. It's a style that doesn’t have to be preppy like everybody thinks. It can actually be quite grungy, which is great. I like the rougher side of it. It’s cool to wear a polo shirt with leather pants or something else that’s rough around the edges. It really balances it out." Talk us through a bit about how you decided to style it in these photos. "I like the whole leather cowgirl thing that’s happening in fashion right now. I feel that the polo shirt looks good and unexpected paired with pieces like that. And then I also think it’s fresh with the 'bad' schoolgirl look. I went for classic black and white because, unless it’s a crazy piece, when it comes to my basics, I only really wear black and white to keep things streamlined. The black one could be either a nighttime or daytime look. I really do like to be casual as much as possible." Do you have any favorite fashion tricks that make you feel pulled together in a hurry? "I stopped wearing jeans. I’m always wearing vintage band T-shirts, and with jeans and boots or sneakers, I felt that I looked too sloppy. The trick was to quit jeans. I don’t even travel in jeans or sweatpants anymore. I started traveling in skirts. I wore one on the plane for every single trip this past month." What’s the last thing that you added to your closet? "A pair of brown vintage leather pants. I found them in a store in Nashville. Then over Christmas in Pittsburgh, I found a long, brown leather trench at Goodwill for $20. They match so perfectly it looks like a set. I’ve been wearing those together a lot. I can't get enough of brown leather right now." Lastly, any trends you’re excited about for summer? "I’m really into tartan skirts and the grunge look. I pair them with vintage T-shirts or a polo and boots. That’s an outfit that I’m probably wearing three times per week right now."